Is that a new cover, why yes it is! The Writer's Process: How Do You Reward Yourself? Colonel John Fitzgerald was my guide to eighteenth century Alexandria, while researching THE SHADOW GUARD. He never made it into the book, at least not directly. So I’d like to pay homage to him now by telling a few stories about him just before St. Patrick’s Day. 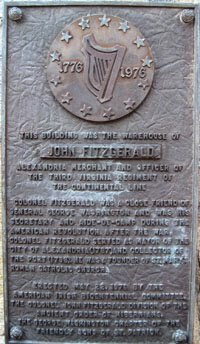 Born in Wicklow, Ireland, John Fitzgerald emigrated to Virginia as a young man via Philadelphia in 1769. He impressed plantation society and was soon elected to the state legislature. Despite the great many languishing glances cast by local beauties, he married a Maryland belle from across the Potomac River who shared his Catholic faith. This truly wasn’t surprising, considering that simply holding a Catholic service in Virginia was illegal. When the Revolution started, Colonel Washington went to Philadelphia, where he quickly became General Washington and gained command of the infant Republic’s army. Fitzgerald joined Washington at Cambridge by St. Patrick’s Day in 1776 and started handling correspondence by July 4th, as part of his Aide-de-Camp duties. Fitzgerald was formally confirmed as Secretary (together with another Irishman) in November, just before the army went into camp at Valley Forge. The heart-rending letters from Washington to Congress, telling about the troops’ appalling conditions and begging for help, were entrusted in Irishmen’s discretion. Fitzgerald stayed with Washington as Aide-de-Camp until 1782, after the great victory at Yorktown.) Together, they accumulated an immense list of battles, tribulations, scandals, and victories shared. The loyal colonel even testified on Washington’s behalf during General Lee’s court martial for incompetence at the Battle of Monmouth. (Some say Lee’s festering hatred afterward opened the door for Benedict Arnold’s treason.) Fitzgerald also provided Washington with the necessary proof to stomp out a Congressional conspiracy to remove him as Commander-in-Chief. 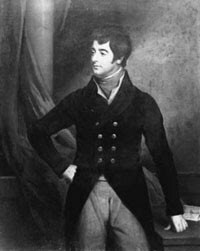 All the while, Fitzgerald’s cousin – Lord Edward Fitzgerald, later to become a great Irish patriot – served in the British Army against America. After the Revolution, Fitzgerald and Washington remained very close. They became business partners, with Fitzgerald becoming one of the four directors in Washington’s Potomac River canal venture. They dined together frequently and slept at each other’s homes. Washington was undoubtedly careful not to show up when mass was celebrated at Fitzgerald’s house, the only place of worship for Catholics. In 1793, they quarreled over politics. Fitzgerald felt America should greet the French Revolution warmly, while Washington believed a more deliberate approach should be taken to any group who’d executed their monarch. Washington wrote Fitzgerald a letter of explanation and asked for discretion regarding the final section. Bound by a Virginia resolution, the younger man had to publish the entire letter. It caused a sensation but ultimately changed none of America’s diplomatic tactics. Their friendship survived even this. Within a year, letters were flying back and forth between them as if they’d always marched to the same beat. By the early 1790’s, Alexandria’s Catholic population had outgrown the Colonel’s house. (Or perhaps there wasn’t enough room under one roof for both the priest and the colonel. Who knows?) At any rate, land was donated for a church but money was needed to build a church. Unfortunately, establishing a grand building would make it vulnerable to unkind souls, who remembered all too well when Catholic worship had been illegal. And so, on St. Patrick’s Day in 1794, General Washington dined with his old friend Colonel John Fitzgerald. 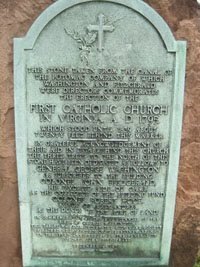 After dinner, the first name in the subscription book to build the first Catholic church in Virginia was General George Washington, with Colonel John Fitzgerald as collector of funds. The General and Colonel saw each other for the last time on the General’s last public appearance, a few days before his death. The Colonel died a few months later and is buried on the road to Mount Vernon, still in service to his commander and his adopted country. Here’s to St. Patrick’s Day, Colonel Fitzgerald! From 1775 when you joined General Washington at Cambridge to 1794 when you started laying the foundation for the church, thanks from one descendant of Eire for all you did in peace and war. Have you ever had something pop up in research that just wouldn’t leave you alone? What did you do with it – or him?